It has been well documented that the long-term hiatus of the Fantastic Four as a title at Marvel Comics had more to do with movie rights than comic books. 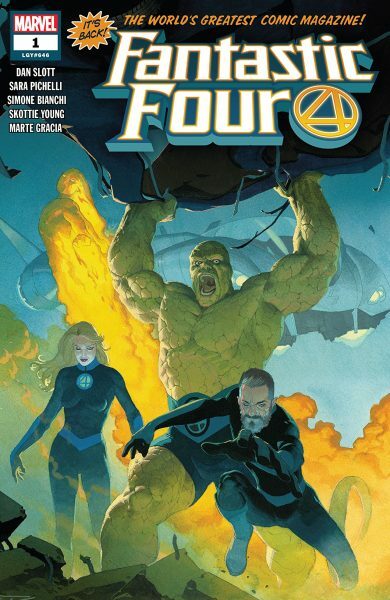 While it is also true that Fantastic Four has not been a top-seller for quite some time before its cancellation, the title has generally been regarded as strong, and Jonathan Hickman’s run before the break is often thought of one of the best. This now seems an instance, though, where absence has made the heart grow fonder, as there appears to be a genuine enthusiasm about the Fantastic Four for the first time in a while. It helps that the book has a creative team as excellent as writer Dan Slott (Amazing Spider-Man, Silver Surfer) and artist Sara Pichelli (Ultimate Spider-Man), but Fantastic Four #1 and #2 come back with a bang, with an indication that bigger things are still in store. Fantastic Four #1 mostly centers around Johnny Storm (The Human Torch) and Ben Grimm (The Thing), the two core members of the Fantastic Four still on Earth. As far as anyone in the Marvel Universe knows, the Richards family disappeared during the events of the most recent Secret Wars. Johnny hasn’t given up hope yet, stubbornly clinging to the feeling that they aren’t doing enough to find Reed, Sue and their kids Franklin and Valeria. Ben, on the hand, seems numb, unable to bring himself to believe they may be alive because he has hoped too many times and been hurt too many times when the Richards clan did not return. Even his longtime girlfriend and now fiancee Alicia Masters cannot get Ben to consider Johnny’s viewpoint. 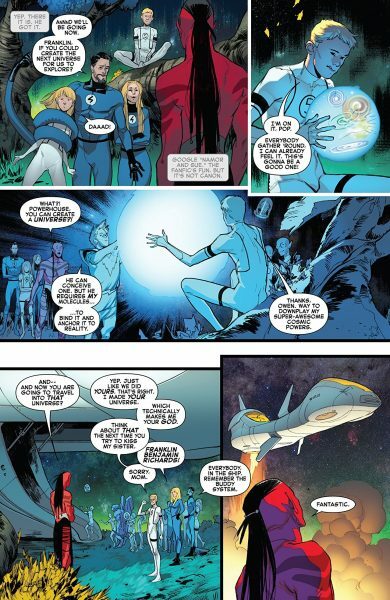 However, just as Johnny starts to go down Ben’s path, disappointed that yet another sign of hope is dashed and starting to feel that maybe the rest of the team is gone forever, they all – and when I say “all,” I mean the entire planet – gets a sign that not only is Reed still alive, he’s bringing the team back. Fantastic Four #2 is actually mostly set prior to the first issue, although that is not apparent until the end of the issue. We only saw Reed and Sue for a few panels in the first issue, but we get caught up on what is happening to them in #2. Reed and Sue have been, along with a group of child/teen genius superheroes called the Future Foundation (to which Franklin and Valeria belong), resetting universes and realities that had been destroyed by the Secret Wars. Someone is not happy about it, though, and that is a new character called The Griever. She seems immensely powerful and begins to wipe out all of the universes the Richardses recreated, and quickly dispatches the Future Foundation. In a moment of hubris, she mocks Reed’s team. He responds by saying that this is not the actual Fantastic Four – and The Griever acquiesces that he can bring his entire team to challenge her. Reed does just that, and this is actually the signal that Johnny and Ben see at the end of issue #1. This is an interesting way to bring back such an iconic team. 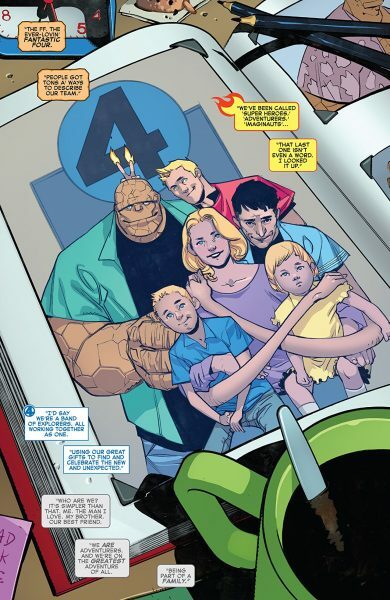 Johnny and Ben had been separated from Reed and Sue for so long, that I think it makes sense for Slott and Pichelli to keep their story mostly separate in Fantastic Four #1, and then tell the Richards/Future Foundation tale in issue #2. The one major drawback of this set-up, however, is that the new badass villain is not seen at all in the relaunch issue. 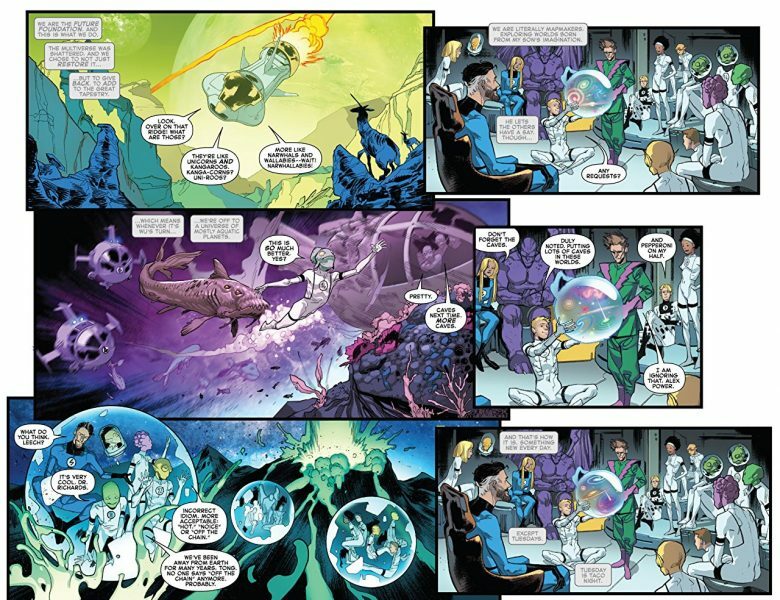 I think that Fantastic Four #1 works because Slott and Pichelli are adept storytellers, but I can also see some readers being underwhelmed in a way that would not have been the case had The Griever been established in the first issue. It’s possible that some readers didn’t like the lack of tension in Fantastic Four #1 and didn’t return for the second issue, but I think that is likely a small number. Anyone who did stick around now knows the major stakes, the major villain and the apparently major throwdown that is slated for issue #3. The trick that Reed, super-genius that he is, manages at the end of Fantastic Four #2 is that The Griever says he can bring his “entire” team, and so Reed summons not just Johnny and Ben, but every member of the Fantastic Four ever – and if you are not familiar with their history, it is quite a line-up. At one time or another, the following heroes have been members of the Fantastic Four: Spider-Man, Hulk, Wolverine, Ghost Rider, Luke Cage, She-Hulk, Black Panther, Storm, Medusa, Ant-Man, and many others. They are all teleported for the upcoming battle with The Griever. It’s possible there will be a twist and they all do not get to fight. However, if they do, that is quite a powerful assemblage of characters Reed has gathered, and goes to show that he is not just book-smart, but also an effective strategist and team leader. It is interesting to see Pichelli on Fantastic Four because she is mostly known as an artist on Ultimate Spider-Man (she is the co-creator of Miles Morales). Spider-Man suits her lithe and angular drawing style, but Fantastic Four #1-2 show that she has a range of skills. A bulky behemoth like Ben Grimm looks just as good as the stretched-out Mr. Fantastic. Pichelli also nails the emotional beats in issue #1 especially, when Johnny and Ben are really going through some feels. Issue #2 showcases her strength at action. As long as Pichelli is able to keep up with the title, Fantastic Four promises to look great. There has been a lot of excitement and build-up for a return of the Fantastic Four, especially for one helmed by a beloved Marvel writer like Dan Slott. He has not disappointed so far. In two stories, Slott has established what is essential and fascinating about each member of the team, showcased a compelling new villain and set-up an exciting premise for upcoming issues. I have some qualms that The Griever seems a bit overpowered, but we do not know that much about her yet – so I guess it remains to be seen if she is indeed as nearly omnipotent as she appears. Overall, however, Fantastic Four #1-2 is an excellent return for Marvel’s original superhero team.